Sodium Free Zoye But-R-Lite® is a high-quality cooking oil infused with natural butter flavor that can replace butter virtually anywhere in the kitchen. 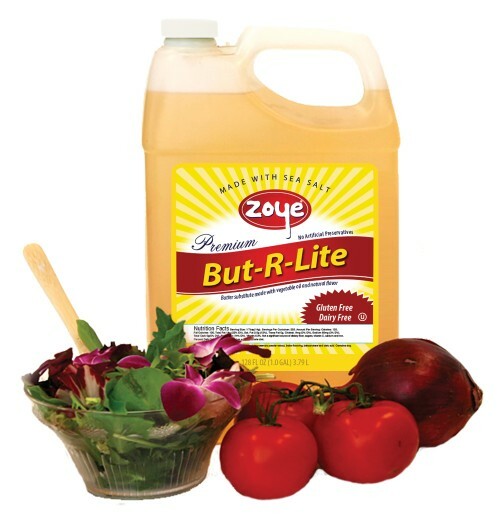 Sodium Free Zoye But-R-Lite® is a delicious, creamy cooking oil with versatility that surpasses other butter substitutes and is perfect for frying, sautéing and as a pan coating. It is also delicious as an oil for popping popcorn and works well as a flavorful topping for corn-on-the-cob, pancakes, popcorn and much more. Use But-R-Lite anywhere you would use vegetable oil, but prefer a smooth, buttery flavor.